Recently I received a request from a custom kydex holster company for me to review their product. I want to do this since some readers also asked for a review of a moderately-priced (less than $60.) Kydex Outside the Waistband (OWB) belt holster for a 1911 handgun that has full barrel-length coverage, an open muzzle design, was durable, and with secure and adjustable retention for the gun for home, range, and competition use (e.g. USPSA and IDPA.). I was also particularly interested in one that would minimize scratching the nice stainless silver finish on my 1911 in 9mm, even though I already have two nice holsters for it. There are several existing nice kydex 1911 holster makers in the market, but I was not aware of any with the desired features as described, with quality workmanship and that are priced less than $60. One was sent to me to fit my 1911 by this new (open for less than 2 years and still developing products) small (two-person shop) holster manufacturer, so this is my review of it. I want to give you my opinions and the factors I used for assessing this holster and for my holster decisions in general. And I wanted to give this new small business a look. 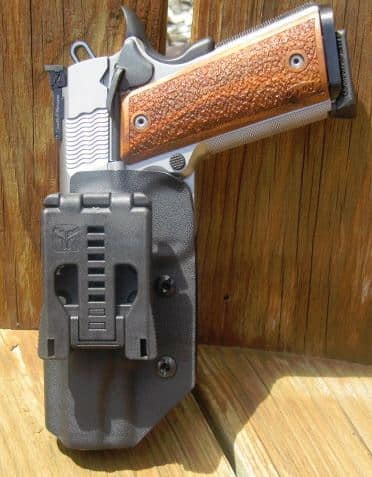 I will give you my criteria, my ideas and opinions, and my recommendation about this holster to help you with your decision, as I go through my review process for the Critical Response Tactical (CRT) Kydex holster custom for my 1911. One of the co-owners told me that their competition holsters are not listed on their website because as of now they are Custom Order Only until there is more of a demand for them. You can email them from their website for custom orders and a quote for your gun. Also, I requested a kydex magazine carrier/pouch, but they are in the development process for it and have not developed one yet to send. I certainly do not have all the answers for holsters and what works for me may not work for you. Selecting a holster is a very personal thing and there are a lot of individual preferences and factors that are involved. So, really it is your personal decision according to your factors, use, and priorities. 1. QUALITY: What is the material and is the holster constructed with quality? Is the bonding and/or stitching strong, durable, and does it look good? What is the material thickness? Will it stand up to your particular demands, wear and tear, and is it appropriate for your use without impairing performance and mechanical function? What is its durability for your use? Are the rivets, clips, grommets, snaps, buckles, rings, magnets and/or metal parts strong, rustproof, and quality made? If appropriate for you, does it have a sweat shield or skin guard? Is it a reputable company with known quality standards and an established quality reputation? What type of warranty or guarantee does it have? Can you get a full refund and/or unconditional return if you are unsatisfied for any reason with the holster? Is the refund or return period adequate? 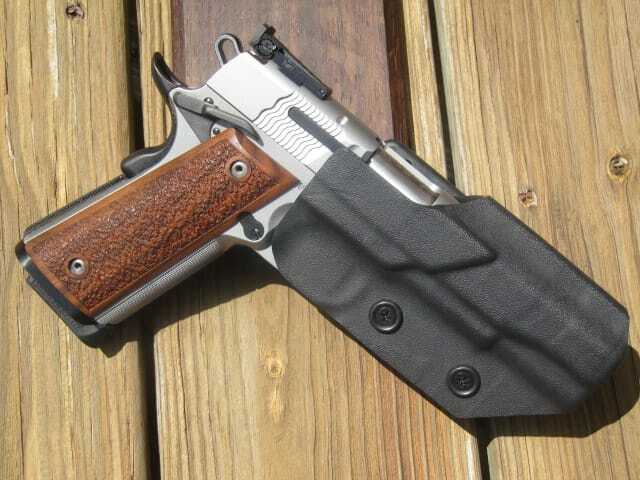 Is the holster designed to minimize the wear on the finish of your gun? 2. ALL DAY COMFORT: How comfortable is this holster style during each of the different physical positions; walking, bending, jumping, running, sitting, standing, reaching, and twisting? Can you wear it while driving? Can you wear it for the entire day comfortably and not even know that you are wearing it? 3. CONCEALABILITY and/or PERFORMANCE: Does the holster perform as required for its effective purpose, be it concealed carry, competitive shooting, general range use, etc.? (The holster reviewed will be used for competition shooting.) How well does the holster protect and cover the handgun during body motions, like running, jumping, walking, bending, sitting, standing, twisting, reaching, etc.? Imagine wearing the holster during these different movements for your purpose. Is there a cant and angle adjustment for the holster, to provide better performance, concealment, and/or comfort? Can you draw your gun smoothly and properly with the holster? 4. 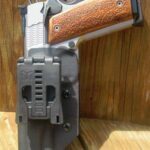 ADAPTABILITY & FIT: Can this holster be used for different handguns or with a Laser sight or light? Is it presently manufactured and available for guns with a Laser sight or light? How versatile is it? Does it have adjustable retention for the gun? Is there an adjustment so it will accommodate different belt widths and loops? Are the safety features of the holster engineered and designed for a specific model handgun? Are there modifications available, options, or additions that adapt to other handguns? What are the approximate costs of these adaptations, if any? Is the shooter’s gun(s) properly fitted for this holster, not too tight and not too loose? Does the handgun insert so deep in the holster that the gun grips cannot be properly accessed? Is the trigger covered by the holster? Does the gun jam so tight into the holster that it takes two hands to draw it or can you draw the gun easily with one hand? 7. EASE OF REHOLSTERING & ACCESS: Can you reach and present your handgun quickly in an emergency or while sitting in your vehicle or for your intended use? A rigid holster will allow a handgun to be returned to it using only one hand, while a flexible one may collapse after the gun is drawn, requiring the use of both hands to reholster. How easy is it to access your weapon and use the holster while walking, bending, running, sitting, standing, twisting, etc.? 9. ACCOMMODATIONS: Can you wear both open and/or closed cover garments with the holster, as needed and appropriate? Can you effectively use the holster while wearing shorts, capris, sweatpants, or clothing without a belt, as applicable and as desired? Do you have to wear special clothing or make accommodations in dress or draw when wearing and using this holster? Is a cover vest or larger trousers required to hide the holster and handgun, as desired and for your use? Is the holster lined to protect the finish of your gun, as desired? 10. MISCELLANEOUS: What is the quality and reliability reputation of the manufacturer? How long has the company been in business? Is the company known for meeting promised delivery dates and for delivering the holster/products in a timely period? Are desired features, styles, models, and accessories readily and currently available for shipment, rather than waiting for a month or more? This holster is made of rigid kydex with the appropriate amount of thickness for strength and durability in my opinion. 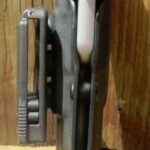 CRT (Critical Response Tactical) says on its website that it is a “custom Kydex holster” company based in the heart of South Philadelphia, PA and “specializes in concealment holsters designed to be minimalistic, but rugged enough for everyday use.” The holster seems to be well-made for $55. The holster’s finish was hard, durable and at least for my short wear time did not scratch the stainless barrel of my 1911. The kydex material used was .080 in thickness. I think this holster will be durable for everyday use. Here is what appears on their website about their warranty, returns, discounts, etc. I wore it regularly for 2 days during my everyday routine activities and it was comfortable. My gun was retained well and it was secure for normal daily activities, not running or in competition. I regularly drew my handgun from the holster and re-holstered it comfortably, smoothly and could do both easily with one hand. 3. CONCEALABILITY and/or PERFORMANCE: NOT APPLICABLE for Concealed Carry purpose. The holster fit my S&W Pro Series 1911 in 9mm well. The bottom of the holster was open ended and there was a channel on the front of the holster so my sights would not catch when drawing or re-holstering. The gun was not too tight, nor too loose in the holster. The price is reasonable and acceptable, but not great. 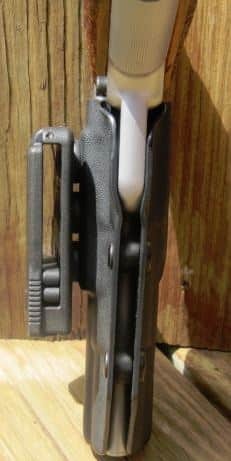 Considering there are other kydex holsters (but non-custom) on the market for $25. or so as available alternatives. Personal preference for your purpose. This holster provided more than adequate safety protection for the handgun. It was designed appropriately to allow you to grasp the gun properly for safety concerns. I was able to keep my trigger finger straight along the outside of the holster easily and to grip the gun quickly and correctly while it was in the holster, to prevent negligent discharges, accidental trigger movement, and without accidental disengagement of the manual safety or hammer movement. The holster offers adjustable retention screws so you can make it as tight/loose as you want. It has a special TekLock to help you adjust for a belt between 1.5 to 2 inches wide. Considering that I am not very mechanical, it was difficult for me to identify and use the mechanism for unlocking the lock on the back of the holster so I could adjust for belt widths. A simple diagram or description was not included in the packaging and I contacted them with this recommendation for their special TekLock. After two emails, I was able to do it and it is a nice feature after you understand how it works. Again, I am not Mr. Mechanical Wizard. It was easy to reach and draw my handgun quickly from the holster and there were no problems in re-holstering it without looking or using two-hands. Almost all of the time my gun was retained well in the holster, but one time when I bent completely over and reached behind me to pickup something from the floor, my gun fell out. But how often do you do this type of movement? It does have retention adjustment screws and I was pleased with the level of adjustment I had made before the movement, but I could tighten it more. I need to wear it during competition and running and bending actions for a longer time to really assess this criterion. This was very easy to do for a belt holster. I really like how quickly you can slide the holster on and take it off. This is a nice feature of this holster. Once on the belt, it was positioned firmly and I knew where the gun was to draw it easily. Going to the post office and quickly slipping off the holster was also easy for me, if that’s what you want to do. Putting it on and off under stress is also probably very easy to do quickly. You can wear both open and closed cover garments with this holster and not have a concealment or operational problem? There is no design problem that would prevent using any type of coat, shirt, sweater, zippered jacket, or any garment with this holster. No special clothing or extra accommodations in dress or draw needed when using this holster? One of the advantages of any belt holster is the stability. There was not an option to line the inside of the holster, as I initially was considering. There are kydex holsters available with lining from some manufacturers. I do understand that some believe that this may actually lead to more tarnishing of the finish and scratching of the gun because of retained debris. It was difficult to adjust the special TekLock without a schematic or simple instruction. After time understanding the mechanism, it was easy to do. This small, quality two-man firm was very busy with attending gun shows, R&D, taking vacation, etc. and I had to wait a few weeks to receive the holster, since it was considered a custom job. The promised mag carrier was not delivered now, as development was not complete for a universal single-stack carrier. But the co-owner said he would send it after development. He was so very nice, knowledgeable, helpful, and friendly, but I believe given the small two-man shop he was very pressed for time. I believe they will be successful. Total Points: 80 points out of 90 possible = 89% = Recommended. Photos by author and CRT website photo. * This personal opinion article is meant for general information & educational purposes only and the author strongly recommends that you seek counsel from an attorney for legal advice, your own personal certified weapons trainer for proper guidance about shooting & using YOUR firearms, self-defense and concealed carry. You alone bear responsibility for making decisions about your shooting gear and accessories for your purpose. This information should not be relied upon as appropriate for all shooters & the author assumes no responsibility for anyone’s use of the information and shall not be liable for any improper or incorrect use of the information or any damages or injuries incurred whatsoever. © 2014 Col Benjamin Findley. All Rights Reserved. This article may not be reprinted or reproduced in whole or in part by mechanical means, photocopying, electronic reproduction, scanning, or any other means without prior written permission. For copyright information, contact Col Ben Findley at [email protected].